After 3 races Lin Cenholt & Peter Lubeck lead, followed by Tom Phipps & Nikki Boniface. Iker Martinez is back after the injury which left him out of Rio qualys for Spain. Fernando Echavarri & Tara Pacheco continue their past campaign too. Henri Demesmaeker is present and now fully involved in the major leagues after years of dominating the youth arena. 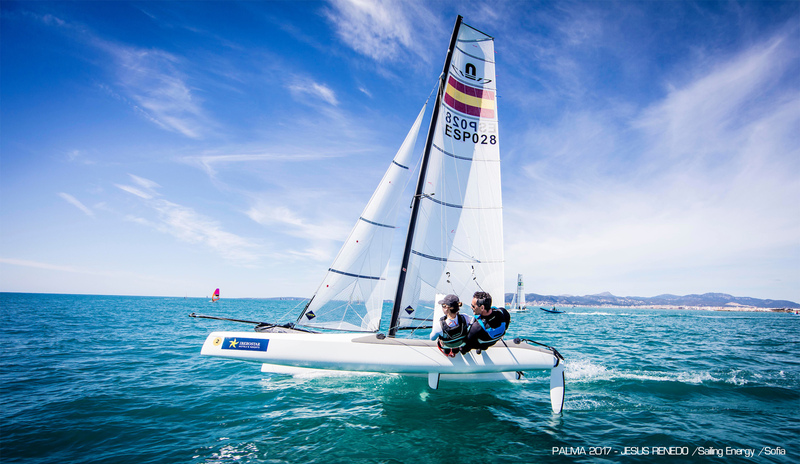 Current Gold medalist, Santi Lange is training in BA and looking forward to the foiling mode. Representing Argentina, we have a new crew formed, simply the future of local Sailing with Mateo Majdalani (AC45 Youth Helm & Lange assistant coach) and another great talented youth like Eugenia Bosco, who is one the most experienced catsailors crew by now with several seasons in the F18 and Nacra 17, and coming from successful 29er years. Mateo also has some flying hours on the Moth and has sailed with us in the A-Cats a bit. More than proud than having them representing us trying to follow Grandpa Gold Lange and Ceci Carranza.